Maddy Barrett, Year 12 student at St Mary’s Anglican Girls’ School Karrinyup, was named the Zonta Club of Perth Northern Suburbs’ Young Women in Public Affairs Awardee for 2017 at a Presentation Dinner held at Ambrose Estate Wembley on 2 August. The goal of the Zonta International Young Women in Public Affairs (YWPA) Award Program is to encourage more young women to participate in public affairs by recognizing a young woman’s commitment to the volunteer sector, evidence of volunteer leadership achievements and a dedication to the empowerment of women. 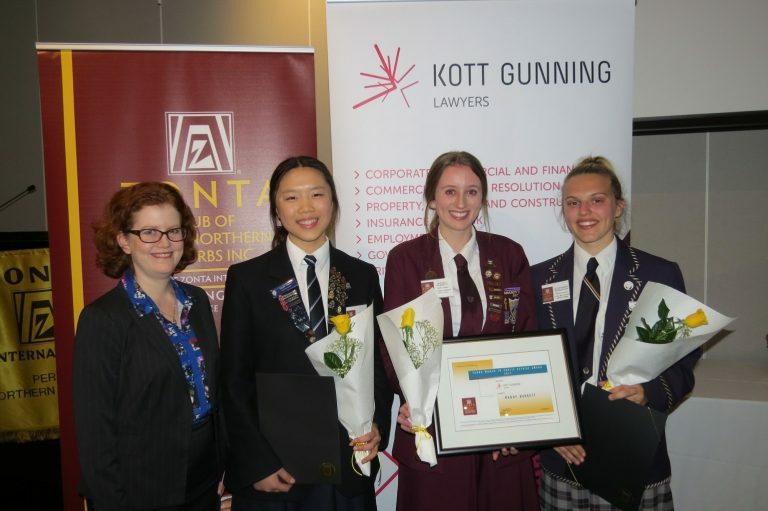 This is the 6th year that Kott Gunning has sponsored the ZONTA Young Women in Public Affairs Award. The firm encourages the pursuit of excellence and regularly contributes towards prizes and awards to recognise individual achievements. “We are proud to be associated with these Awards and congratulate all three finalists on their achievements” says Marketing Manager Tanya Kay. Maddy received a $1000 cheque and framed certificate. The other Finalists were Alexandra Robinson from Irene McCormack Catholic College and Sarah Soon from Perth College. The MC for the evening was Dr Demelza Ireland who received the Award in 1996. She is now a Research Fellow/Lecturer and Honours Coordinator in women’s health at UWA. Maddy has also been recognised by St Mary’s for her community involvement, won a scholarship to a leadership conference in Los Angeles and last year volunteered to take part in a World Challenge Expedition in Laos where she was responsible for guiding 16 girls. Applicants are asked to reflect on their voluntary commitment to their school and their community and the problems limiting the empowerment of women in their own country and worldwide. The Zonta International Young Women in Public Affairs (YWPA) Award Program looks to the young women of today for the leaders of tomorrow. For more information about the organisation, refer to websites: www.zonta.org, or www.zontaperthns.org.au, or contact the Club via secretary@zontaperthns.org.au.